Time to scream in space again! Finally, after the incredibly boring “Prometheus,” Ridley Scott gave us #AlienCovenant which reminds us exactly why we sci-fi horror fans have always loved this franchise. This is not only a return to form, this movie will scare you to your core. Undeniably terrifying. Katherine Waterston’s character Daniels may not be completely equal to Sigourney Weaver’s iconic character Ripley but Daniels is badass in her own right. Scripted by John Logan and Dante Harper with story by Jack Paglen and Michael Green and directed by the man who helmed the first original “Alien” film, “Alien: Covenant” is essentially a sequel to “Prometheus.” You get to see what happens to Elizabeth Shaw and David, while at the same time there’s a crew of a colony ship arriving on a remote planet that they think is an uncharted paradise but the reality is far more sinister. They then must fight their way to escape the ever present threat. A couple of things in “Alien: Covenant” that I think stand out, one of which is the interaction between the dual roles that Michael Fassbender has to play in this film. As both Walter and David, Fassbender is like two sides of the same coin but he understands that one is ambitious while the other is protective so the Oscar-nominated actor successfully conveys those differences through his performance. Walter and David provide the profundity that basically motivates the chaos at hand. The other thing that I genuinely enjoy is the film’s consistency in its terror. It doesn’t take too long of a breather time, it goes on a fight or flight survival mode every other ten minutes or so which is great because you get exactly what you’re paying to see. I feel like with “Alien: Covenant,” Ridley Scott learns his lesson that while it may have been important to build things up and create the context through “Prometheus,” but taking what makes this franchise great out of the equation was not a smart move. So in this one, it’s on hyperdrive, especially with the white Xenomorph-like creatures, called Neomorph, they are as vicious as they get. They’re faster and more cunning and how they burst out of a human body is more sadistic. Fantastic work by those involved in designing those crazy bastards. Using today’s visual effects technology, Scott and his team also manage to orchestrate intense action-packed sequences for this film that they probably could only imagine doing back in 1979. Speaking of which, I think some fans out there might see “Alien: Covenant” as some kind of a rehash in the same way that “Star Wars: The Force Awakens” may have been a rehash of the original “Star Wars” film, in that they will be able to point out similarities. 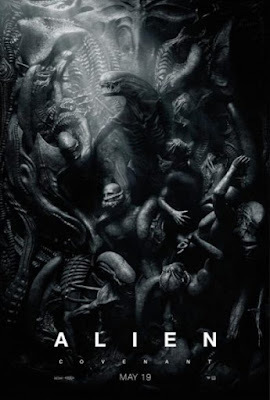 But just like that case, in that same manner, I think “Alien: Covenant”s purpose is to bring back that fright, to bring back that scare factor and to reinvigorate this franchise once more.